Phil Jackson is an progressive/ space rock/ electronic artist from Scotland who has been recording since 2000 as Paradox One. Over that time he has released a number of CDs on Rick Ray’s Neurosis label and his own ‘7’ label. His most recent work is a collaboration with members of Census of Hallucinations and Clear Blue Sky entitled ‘This Fragile Peace’ on Stone Premonitions. Before moving onto his next project Phil has reworked/ remodelled his earlier recordings to present a retrospective of his music so far. Further projects await so meanwhile please rediscover and enjoy! ‘Dimension of Miracles’ awaits with more sci-fi references, mostly Bob Sheckley. There is a guitar based riffer with a salutary message, ‘Big Brother’ and a ‘tragic realm’ of Elizabethan proportions inspired by Giles Milton’s depiction of adventurers of the time. Or you might prefer an eerie evocation of ‘Quatermass’ or another Schumann interpretative piece ‘Out of The Void’. The past is presented with additional organ, piano, vocals and judicious edits. All is free to listen to and comment on- visit my website www.paradoxone.co.uk where the music will be up in time for November via Bandcamp, all going according to plan. A two CD copy (155 minutes of music) is available with much explanation and formidable artwork at cost which means £5 including P&P through Pay Pal individually numbered and named. The future beckons as more projects await. I believe in this music and I hope you will too. It is not perfect. Then again I do not want it to be. 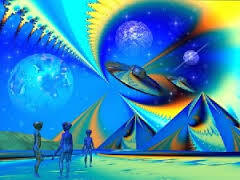 Prepare to be transported to other realms but most of all, explore and enjoy! (The refashioned site has passed its thousandth visitor- thanks to all and to Stuart Hamilton, web guru extraordinaire! The music will also be available on Bandcamp at the very reasonable price of £3.